At Apple’s WWDC one of the highlights that they announced was the highly anticipated iOS 6. With this new release Apple is touting 200 new features…TWO HUNDRED! Well, I’m only going to talk about a few of the features that stood out to me and of those only some are really major improvements in my opinion. So…here we go! I’ve already written an entire post on the new Apple Maps app so I won’t dwell on this too long but in my opinion this was the biggest new feature of iOS 6. I really don’t understand why Google Maps on the iPhone has not had turn-by-turn navigation until now (probably politics) but I’m very excited to see it now. I’m seriously considering switching from Android to iPhone this year and this was one feature that I was worried about. But now Apple has allayed my fears and what I’ve seen so far looks really good. I don’t currently have an iPhone…so I don’t really know how much I would ever use Siri. My wife has one and I have lots of friends with iPhones but they all tell me that Siri is cool but they don’t really use it that often. With iOS 6 perhaps that will change. Apple has beefed the feature up with more sports, restaurants, and movie information so some might find it more useful than actually typing out a Google search. Time will tell if this helps the feature to be more widely adopted. I think this is a really cool and useful feature. Say you’re out to dinner with a friend or your significant other when a call comes in. It may be an important call but you don’t want to rudely take the call during dinner…that might have some dangerous consequences (husbands will know what I’m talking about). If you were to just ignore the call what might happen…it could be one of those people who keep calling over and over until you pick up. Well this new feature allows you to decline the call but also send an automated text message back to the caller. As long as they are calling you from a cell phone they will receive a message explaining to them why you can’t take the call. Another option you have when a call comes in is the “Remind Me Later” option. 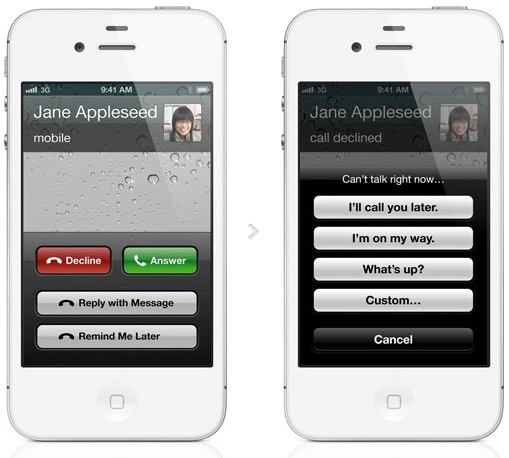 This allows you to decline the call but set a reminder either using either time or location based options. So you could have it remind you to call this person back say when you get home, or when you leave wherever it is you are right now. Pretty useful! Finally there is the “Do Not Disturb” option. This allows you to mute all incoming calls and notifications either manually setting a specific time or you can set a recurring schedule. Very nice if you don’t want to receive any calls say between the hours of 11pm and 6am. I’m sure that all of these features are probably available on Android using apps and some may also be available on iPhone but it’s really great to see them built into the native OS. This really isn’t as much of a feature as it is how Facetime should have been originally. For over a year now other video chat apps like Skype, Tango, and even Yahoo messenger have been able make decent video calls over 3G/4G, and it’s great to see that Facetime finally supports it. There have been several times when I wanted to video chat with my wife’s iPhone from one of my Mac’s only to be let down because she wasn’t connected to a wifi network. I can only imagine that it’s been the carriers who have been preventing this so far but it’s nice to see it finally available. So these are the main things I’m looking forward to in iOS 6…what about you? Tell me in the comments below.